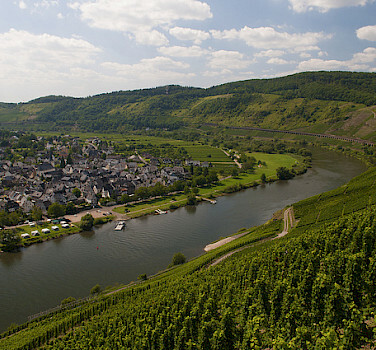 Bike in Europe along the Moselle and Saar Rivers! 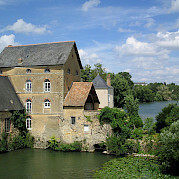 The lovely setting for this bike and boat adventure in France is the green heart of Lorraine, a region of culture and history. 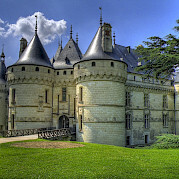 The art and architecture in cities like Nancy and Metz will delight the art lovers. 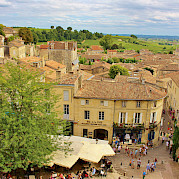 Rodemack, listed among the most beautiful villages in France will be a highlight with its surrounding well preserved fortified walls and for the historians, the WWI battlefields have a beauty all their own. The Maignot Line, a vast fortification that spread along the French/German border will fascinate. For those that travel for the culinary experience, you will not be disappointed and will find the signature foods and wine of the region, hearty and satisfying. Beginning in Wasserbillig and ending in Toul, or reverse, depending on your tour date, you will cycle recently constructed and beautifully maintained bicycle paths and historic towpaths beside the Moselle and Saar Rivers and French canals. 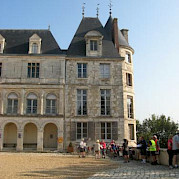 If your interest is to cycle France, check out all of our tours! 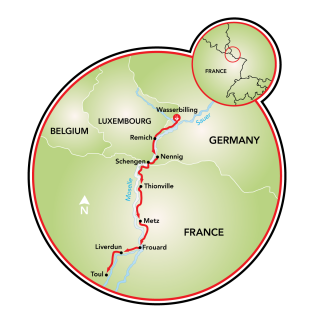 As well as our bike tours in Germany, and Luxembourg! A bus service connects the airport with the central train station in Luxembourg through the bus lines 9 and 16. 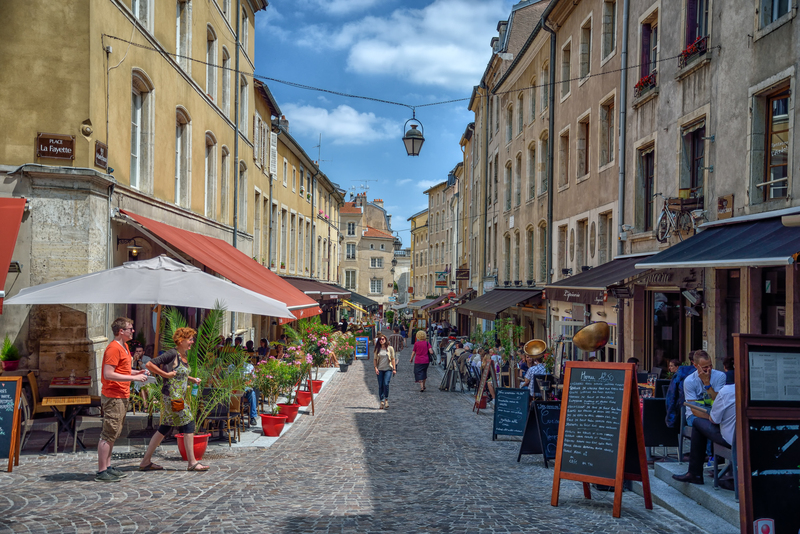 From the central train station to Toul, France, it is about a 2 1/2 to 3-hour train ride (depending on departure time) with one transfer in Nancy. To Wasserbilling, it is only a 35-minute train ride. There are 5 electric bicycles available on a first come, first serve basis. *Please note, the following dates are SELF-GUIDED. *Special diets and vegetarians, please advise at time of booking. A supplemental fee for some requests may be incurred. 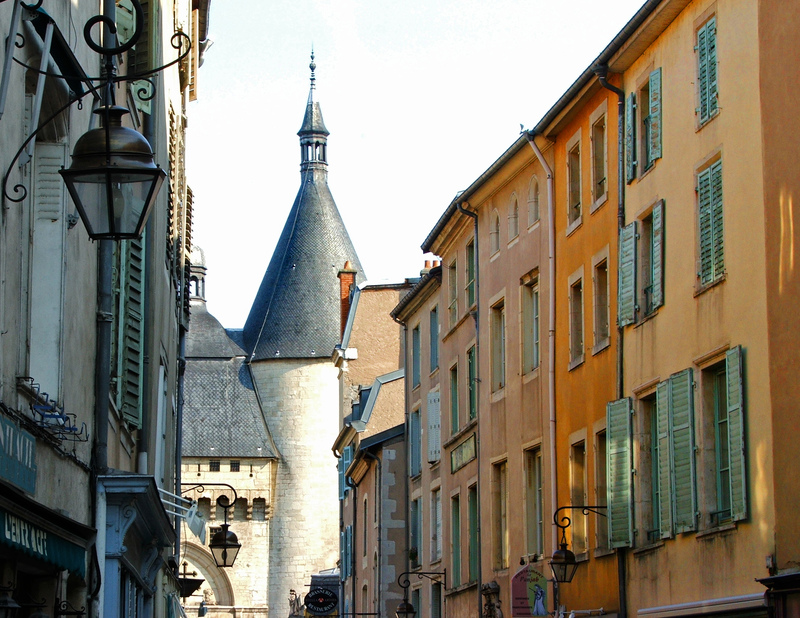 This France bike tour is classified as an easy to moderate guided bike and boat tour with an average daily distance of approximately 25 miles. 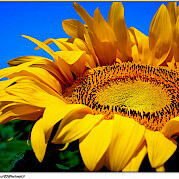 Longest day is 34 miles and the shortest day is 9 miles. The terrain is varied with rolling hills. The crew of the La Belle Fleur welcomes you on board at the Rue de la Moselle in Wasserbillig at around 3 PM, in the border village of Wasserbillig. 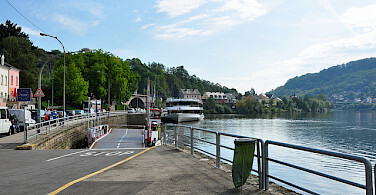 You will enjoy a short bike ride along the Sauer; a tributary of the Moselle river where the boat will be moored. 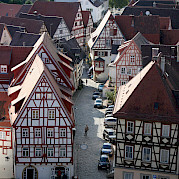 While cycling, you will pass through several typical German Villages. 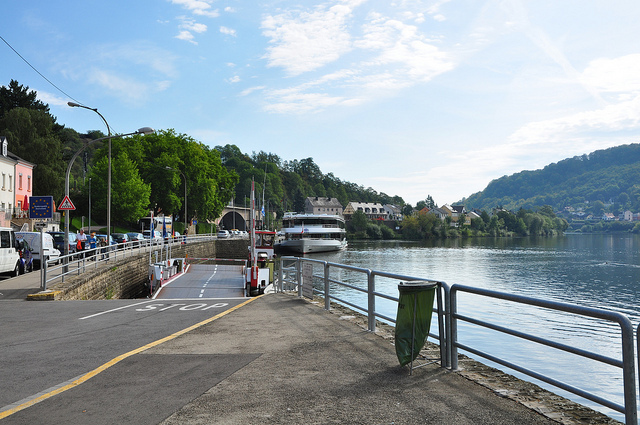 After breakfast, you will cycle to Remich, the pearl of the Moselle River. 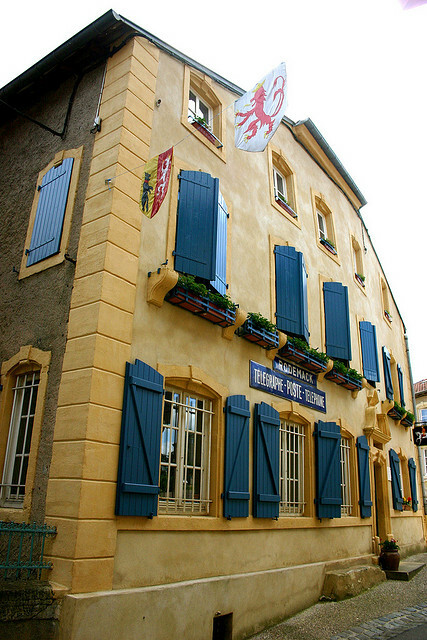 En route, there is an opportunity to visit the small village of Ehnen with its wine museum. After a walk through the old streets and narrows alleys, your bike tour continues to the old Roman villa in Nennig with its beautiful, well-kept tiles. Today you will ride into France and the scenery will change too. 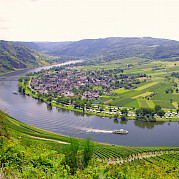 The narrow Moselle valley becomes flatter and wider. This gives you the opportunity to make a deeper acquaintance with the country. But before we leave Luxemburg we visit the small but famous village of Schengen. There were once one of the most important treaty’s was signed, is now a European museum. But a visit to the Maginot-line is certainly also a part of the program today. The underground defense system stretches across the whole area, which was meant to protect France, and at the same time make all facilities available for pure survival. In other words, you’ll be looking at a masterpiece of wartime architecture. 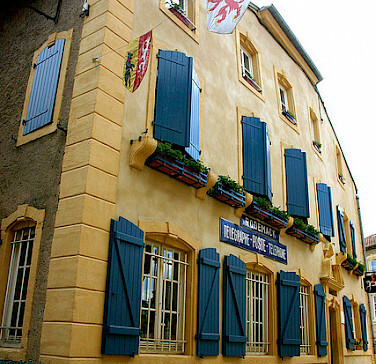 When it is coffee time, La Belle Fleur expects you in Thionville; a city that was rich in metal industry, but today it is primarily a city of beautiful buildings, left behind by the many conquests, such as the Romans, the Luxembourgers, and the Spaniards. 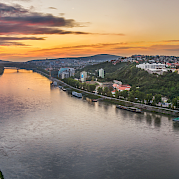 Cycling along the Moselle, this is a day dedicated to all that made this region great, exploring the industrial heritage, nature, and perfect examples of cultural achievements. You will cycle along shady bike paths pass old steel mills. 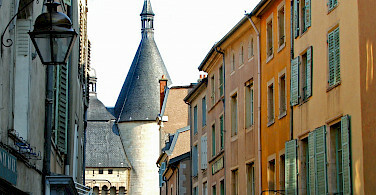 After arriving in Metz, guided city walk will be offered including a visit to the Centre Pompidou, the Cathedral. 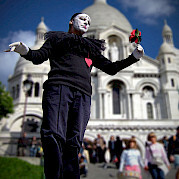 You will enjoy the atmosphere of the many squares and terraces. Now it’s time for a somewhat more adventurous trip; the old towpaths of the Moselle take you to the picturesque Pont-à-Mousson. 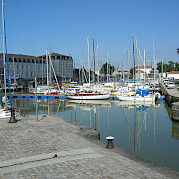 Or you can stay on board and start your bike tour at Pont-à-Mousson. 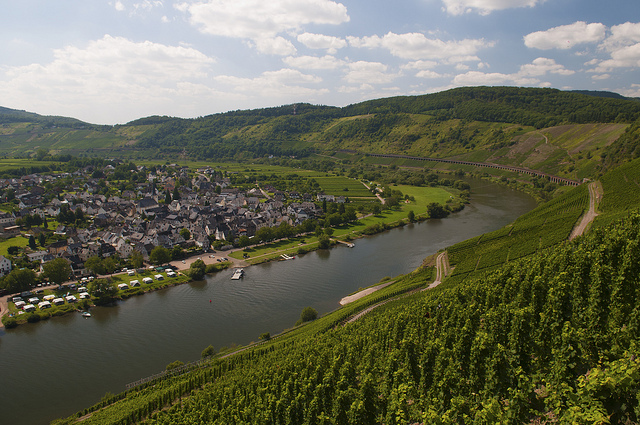 After a visit to this city, which has a typical character because it is situated on both banks of the Moselle, you’ll bike through an old canaled part of the Moselle. As you ride through, you will be amazed by the beauty of the area, as you eventually arrive at one of those typical quiet little French villages of Frouard. 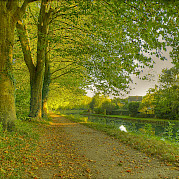 Today the cycle path leads you along the connecting channel between the Moselle and the Meurthe to Nancy. After a visit to this metropolitan city, the tour continues to the old fortress-city of Liverdun. 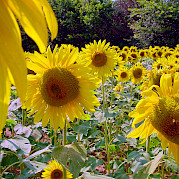 There, the La Belle Fleur will await you at an idyllic spot. From Liverdun, cycle in the direction of Toul. 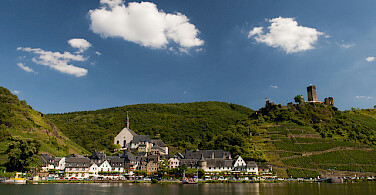 A small, charming fortress-city with a rich history situated at the Moselle’s riverside. After a cup of coffee around 2 pm, the team of the La Belle Fleur says goodbye. Please note distances are approximate. The itinerary is subject to change due to safety or other unforeseen circumstances. This tour is run by Sander van der Veer & Els Keuleers. Most Memorable Part? Staff on boat, people traveling and the scenery. We didn't know what to expect on such a small barge/boat: however it was very enjoyable Our hosts were great and always helpful even when we knew it was a busy time for them. Being a small group and despite some language differences, we all bonded and managed to communicate well. Our leader Anna was particularly competent and took us through some interesting situations without a glitch. We will be known as the group who loves limericks as one guy in our group started by writing one for each cyclist...then of course we all started to write them. The last dinner was quite hilarious. 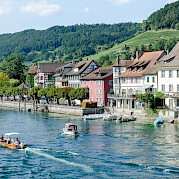 You can't beat these tours for economy, traveling through history and spectacular scenery and commaradorie. I left off one star as the rooms and bathroom were super small and hard to manouver in. Everything else, including the meals, were something to write home about.! Enjoyed the staff, the group we met and the overall tour. I got to visit a part of France I might never have seen. Really enjoyed the champagne bottling winery the last day. I took the Lorraine Tour this September. I was happy I chose to go Toul to Wasserbillig direction since it ended in a greener, more rural area. 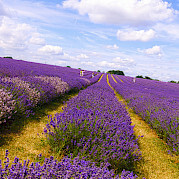 I love the countrysides and small villages best so this ended my week on the most positive note for my personal taste. There were interesting towns/cities to see along the way but this was also a bit more industrialized in some areas than tours I have taken in the past. If you are from the American midwest (I grew up in Ohio) you will swear you have been transported home many days it looks so similar. Others on our tour found it quite beautiful however. I was very impressed with the WWII memorials along the way. Even though I prefer a self guided tour I found our tour guide to be very pleasant and considerate of our physical abilities. I was disappointed with the conditions of the path one (our longest) day since I have been accustomed to fully paved trails on all my other tours. That day was exhausting due to the conditions of the Read more… route. They say this will eventually be fully paved at some point though. The La Belle Fleur was an excellent, clean, comfortable, and well maintained boat. The staff took good care of us and the food was fine. I especially enjoyed the camaraderie of the very small group. Having taken both large and small bike-boat tours I think this is one of the best aspects of a small tour. If I were traveling solo this size group would definitely be my preference. Overall, another wonderful week doing what I love and loving what I did. The boat and the bikes were good, the food was good and sufficient, the crew was friendly and helpful. The scenery was not always beautiful, part of the tour leads through industrial area. We truly enjoyed this trip, with beautiful flowers in every town and swans everywhere. One night, we had a bevy of swans peaking in at us as we ate dinner!. The bikes are great, with comfortable seats and smooth gearing. The dinners were always a delicious surprise. 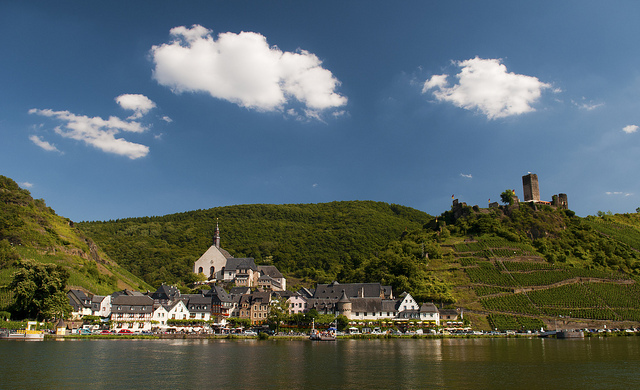 Sanders and Els were wonderful hosts, and our guide, Seitze, was extremely knowledgeable about the history of the Mosel area, including Roman aqueducts, medieval castles, World War II sites, and, of course, the history of the EU. Nancy was my favorite big city but we also had a night time walking tour of a little town overlooking the Mosel, called Liverdun...where delicious Madelines come from! Very cute town. We went in early September and the cabins were a bit warm even at night. You can open windows, but it could be uncomfortable in the summer. Biking was mostly flat so not difficult but I definitely got some exercise. 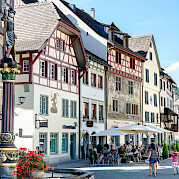 Another favorite: stopping for coffee and pastry each Read more… morning! GIANT bike were like new and well maintained. I was disappointed we could not use the bikes during the city stops that were part of the day trips or after dinner when we returned to the barge. Even though the bikes have locks, Sander and Els don't allow this to minimize theft risk. Besides my husband and I, all participants were in there mid-60s Read more… to mid-70s and didn't seem to mind. A good combination of biking and seeing the sites along the way. Plenty of time in the cities (Nancy, Metz) to wander around. This trip was not about putting on the miles every day on the bike but a good balance of biking and site seeing. Easy biking along canal paths mostly. Our guide got turned around a couple of times getting out of the cities. Els and Sander were great hosts on the barge. Very friendly. Els cooked me a birthday dessert one day that we enjoyed with our group after a day of biking. It was very hot in July and the air movement in the rooms was limited. A small fan would have been very much appreciated. As it was we slept with our door open (as did the others) just to get more air circulation. The barge is in very good condition. The bikes were brand new this season. They are owned by Els and Sander and not leased through a secondary company so they were in good working order. Beautiful way to travel from Luxembourg to France. Bike quality was very Good. Our Bike Guide Arie was very knowledgeable. Every evening we had Four course Gourmet Dinner. Sander and Els were the best Host and Owner of the Barge. 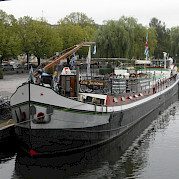 I really enjoyed my first Barge and Bike Tour(June11th to June 17th)Sanders and Els were very Good. I would like to give them 10 out of 10 for their Hospitality. Our Bike Guide Arie was Great. I fully enjoyed the Lorraine/Moselle bike trip (May 14-20, 2016) with the staff of La Belle Fleur. This was my first bike and barge trip and it certainly was a stress free and relaxing way to see the region. The owner/operators of the boat (Sander and Els) were not only very professional, but charming, enthusiastic, and helpful. Els was also a superb cook so our meals were always delicious. Pieter was the perfect guide (and quite the character! ), fun to bike with, patient, knowledgeable of the route and the potential sights, and willing to change the agenda to meet the interests of his clients. 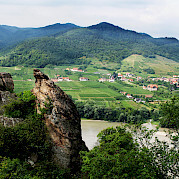 The pace was leisurely and we had ample time to view both the valley scenery and the grand old cities along the route. The bikes were in good repair and suitable for the mostly level countryside we were traversing. Another delightful aspect of the trip was that the route was mostly off the busy roads and on dedicated bicycle paths (except, of course, in the cities). The weather, Read more… though often cloudy and brisk with occasional light sprinkles of rain, was never a problem. The passengers got along well together and we had fun evenings relaxing aboard ship along with the crew. One week of biking seemed just the right amount of time. I came home with many wonderful memories of people, places, and experiences. I can highly recommend this trip and this boat company. The folks at the Tripsite office in the U.S. were also very responsive and easy to work with so they get my "thumbs up" award too! Our guide was not good, would ride off too fast, often the tail end riders were lost and confused as they could not keep up. Everything else was excellent!